Shredding companies like Shred It For Less know that because credit is so hard to come by, shredding your important documents has never been more important for individuals. No longer will an extra credit request or two or an account that you did not know about “just” mean the difference in interest rates. Now more than ever before these kinds of problems can mean the difference between getting access to credit and not getting access to credit, being able to buy a home or a car or not being able to do so. 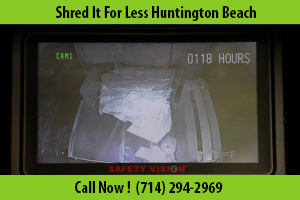 Fortunately for those in and around Huntington Beach, Shred It For Less offers convenient solutions that make document destruction a breeze rather than a major inconvenience. Instead of spending your valuable time paper shredding using your document shredder at home, simply use our drop off shredding services to make secure document shredding as simple and easy as buying a pack of gum. Our drop off paper shredding services is so affordable that you’ll never again decide that the hassle of shredding all of your documents is worth it. Other shredding companies in the area rival our prices and our customer satisfaction. Bring them into our store and watch us take care of them efficiently. If you’re in a hurry, that’s no problem at all! Leave your papers with us and we’ll issue you a Certificate of Destruction, putting your mind at ease about your sensitive information falling into the wrong hands. Those who live in Huntington Beach, especially those looking to clear up papers that have accumulated over a long period of time, also have the option of using our mobile shredding service. Call us to schedule an appointment and we will send one of our mobile document shredding units to your home. Rather than having to pack all of the documents in your car, possibly having to make several trips to our facility, you’ll be able to watch us destroy all of your documents quickly and securely. Unlike other shredding companies we’ll even provide containers free of charge so that you don’t have to worry about buying countless bags and boxes to transport your papers. Perhaps the best part about our scheduled shredding service is that there’s no long-term commitment. If you want, you can only use our mobile shredding service once, such as when you’re planning to move or when you are just settling into your new home. We don’t believe in locking our clients into long-term commitments like many of the other shredding companies in the area. Instead, we trust that our on site shredding service and personal attention will speak for themselves and have clients coming to us for all of their document destruction needs. Whether you’re just looking for an easy and convenient way to shred paper along with monthly bills and statements or you need to dispose of a large volume of documents from a small business, a move, or some other significant transaction or life event, Shred It For Less can make shredding your documents easier than ever before. We manage to make this inconvenient but essential task a breeze with our conveniently located industrial paper shredder facility and our mobile shredding option. Call us to learn more about how we can make destroying your sensitive documents easier than ever.